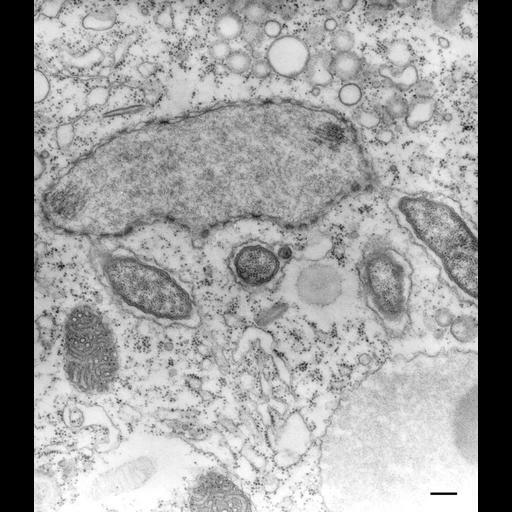 The first culture of P. multimicronucleatum which I had obtained from Carolina Biological Supply House contained a bacterial endosymbiont that resided specifically in the space between the two membranes of the nuclear envelope or in outpocketings of this space so that the bacteria were enclosed by the outer membrane of the nuclear envelope. Such endosymbionts have been observed before (Jenkins, J. Gen. Microbiol. 61:355-359, 1970). In this micrograph the bacteria are associated with the micronucleus, which has a remnant bundle of fibers and microtubules, but bacteria are also associated with the macronucleus (not shown). TEM taken on 12/9/70 by R. Allen with Hitachi HU11A operating at 75kV. Neg. 19,500X. Bar = 0.2µm.